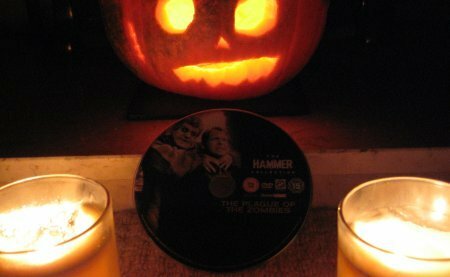 Have a Hammer Horror Hallowe’en! Ah Hallowe’en, the best time of the year for a horror fan, and not just because its the only time you can get Pumpkins in the shops to make Pumpkin stew, but because all of the DVD companies decide to put out every horror film in their store-rooms, and the shops finally put horror films front row with big discounts. I’ve got to give credit to my local supermarket, I found The Haunting (1963), Hills Have Eyes (1978), and to my real surprise Mark of the Devil (1970). Someone will be in for a surprise when they sit down to watch this tonight! So what horror soaked gem did I choose for tonight. None other than Hammer’s often overlooked Plague of the Zombies – a tight and well told tale of Voodoo in Cornwall. With some very good direction and acting, I highly recommend it. Well, it’s not quite All the Colours of Darkness, but here is my first film related appearance in print. 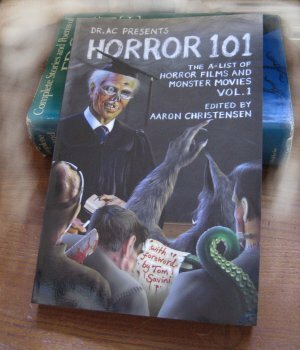 Horror 101 was a group project launched on a few forums last year, with the aim to compile reviews of 101 different horror films into a single book. Perfect as a reference work or for genre newcomers. My personal contribution is a chapter on Amicus, and specifically Asylum (1972). A million thanks to Dr. AC who lead the project, and got it into print. Sadly it is not yet available in the UK (although if there is enough demand, I can import a few copies to pass on, e-mail me!). However you can buy it direct from Amazon.com or the official Horror 101 with Dr AC website today. The year started with cries that cult DVDs were doomed, talk of “over-saturation” and “the end of an era” were banded about. Yet we are still here, and much to everyone’s surprise, heralding the launch of an all new cult DVD company, in England! Shameless Screen Entertainment has been established with the sole intention of distributing ex-video nasties, and the more extreme cult cinema. Their first two titles released earlier this month are a good example of this, and reflect the real possibilities… or the possible realities of this new company. Phantom of Death is a real plus. Previously only available on DVD from Germany, and generally not very well known, despite the presence of the notorious Ruggero Deodato at the helm, it is presented fully uncut and in a good looking widescreen print. New York Ripper is more of a concern. It has been readily available on DVD in the US (although it is OOP at present), and recently released on a very good, feature packed Swedish DVD, the Shameless release has also suffered from that curse that will doubtless hang over the company for a while to come – BBFC cuts. I won’t get into the idiocy of mature and consenting adults in the UK being barred from watching a film freely and fully available in the US, Scandinavia, Italy, France, Netherlands, Australia and Germany. Ultimately Shameless have no way of telling, before they submit a film, whether or not it will be cut, and with the high cost of submitting a film, they can’t afford not to release it afterwards. However, they do know when a film has been previously released, and perhaps should be looking to fill the gaps in the market rather than simply doubling up – although from the Joe-six-pack perspective, titles like “New York Ripper” are much better known, and likely to sell a lot better in stores. Shameless are certainly the most exciting company to emerge this year – their superb cover-art and well written case notes show a real love for the films that many of the other cult DVD companies, and certainly the majors seem to be missing. Some will doubtless criticise the lack of bonus features on the discs, but at their own admission, the company have said that the cost of recording interviews etc. would force them to cut their releases from two a month, to one every two months – and while it is a pity not to get to hear Michael York explain just how he came to be cast in a Giallo film, it is a worthwhile sacrifice to simply get the film out on DVD. 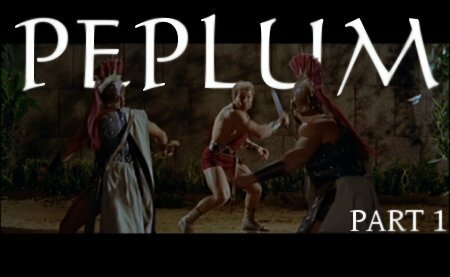 So lets just hope that they survive the BBFC maulings, and make enough sales with the better known titles to allow more unreleased goodies to emerge in 2008. Well, its been a while, but I’ve been working on something big – and here is the first part of an all new Mondo Esoterica guide, with four all new reviews. You are currently browsing the Mondo Esoterica – Blog blog archives for October, 2007.